This week we ask CEO Gordon Oakley about his unique leadership styles and personal experiences behind building Malton Inflight over the last 30 Years. There have been many personal experiences which I’m sure led me to develop my own company, Malton Inflight, but perhaps the one that stands out the most in my mind was in my early days as a Buyer with British Caledonian Airways. In many ways BCal was a remarkable success story, a ground-breaking company; indeed, it was the airline who arguably invented business-class air travel in the late 70s. At the time I joined, it was the 2nd largest British airline and was renowned for providing excellent service. It was also growing rapidly, adding new routes to West Africa, North and South America and the Far East. Despite being based at London Gatwick in the South East of England, the airline had a strong Scottish identity, with the Golden Lion tail-emblem on the planes and the cabin crew wearing distinctive and colourful tartan uniforms. After spending a year or so in the “pressure-cooker environment” of the AOG aircraft technical spares desk, I was then offered the option of an internal transfer to become the Buyer for the Catering and Cabin Equipment used on board the entire airline fleet.Thiis was a new challenge, which suited me far better. I could relate to the products which I was sourcing, and I also found my new role much more interesting and motivating because the airline had such a good reputation, a strong brand and an international profile. It was in the news quite frequently and had a series of distinctive commercials. 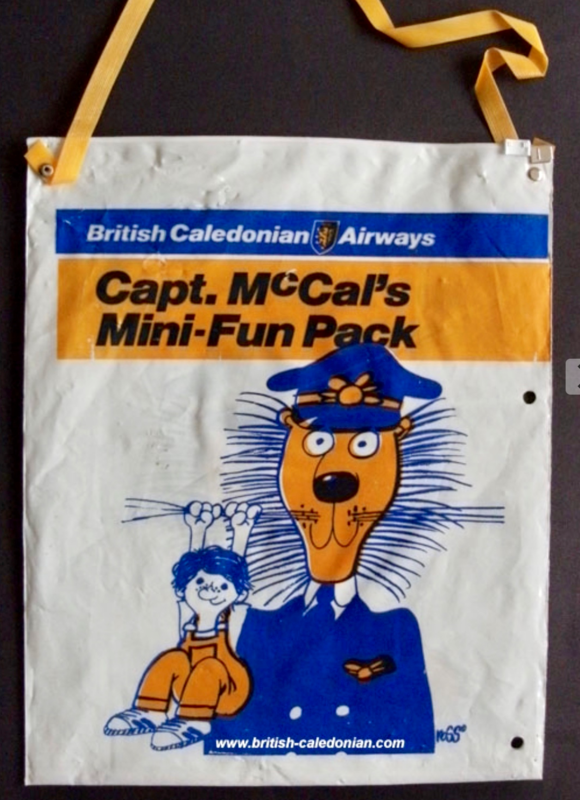 One of my responsibilities, in my new position, was to source a popular on-board giveaway pack for children, which was called a Captain MCal pack. By today’s standards, it might not be considered to be complex or particularly difficult; it was simply a set of bags, containing books, puzzles and toys all bearing the distinctive “Capt. MCal” lion branding.At the time, however, it was a popular and prominent component of the BCal in-flight service and therefore, from a marketing perspective, quite important – to me at least. Being a ‘big kid’ at heart myself, I had fun road-testing the items, and it was fascinating to meet and talk with the external brand-designer, Ross Tomson, who was quite famous in his field. Ross and I were sent on an important mission, to fly to Hong Kong and source new items for the packs. I had a great time, flying First Class, which felt very special in itself. Upon our arrival, we immediately embarked on the task of visiting factory after factory, mainly in the backstreets of Kowloon and I was struck intensely by the energy and buzz of such a busy and vibrant city. In particular the enthusiasm, flexibility and dynamism, which all these small Chinese factories seemed to possess, along with a willingness to create samples for us very quickly and efficiently. Compared to life back home in England, this was a completely new experience and left a mark on me, which I am sure would later lead me to develop Malton. Do you have a unique leadership style other CEOs can learn from? I think it would be arrogant and presumptuous of me to believe other CEO's could learn anything from my leadership style, but I would say that I have always believed in trusting individuals and my team and delegating tasks to them. Of course, this was not an issue when I started the company, because I was working completely on my own from home; initially from an “office” (in reality a bedroom), which comprised of a desk, a telephone and all the household junk! It wasn’t ideal, but it was the best I could afford at the time. Later I moved into an ex-show home and used the double garage as an office; this had already been converted into something more akin to a working environment, furnished with some second-hand desks and chairs, kindly provided by my father-in-law. By that stage, my first two children had arrived on the scene, and it was a case of juggling work, alongside the duties of being a parent. Gradually though, as the business grew, I started to take on employees and moved to a bigger office away from the family home. I still have a habit of working from home sometimes, but it’s also important to get out of the house and go to an office, to meet face-to-face with my colleagues.One habit which I’ve recently adopted and found very helpful. Every morning we have a short stand-up meeting, where each person in the office speaks and shares with everyone their respective priorities for the day. It’s as simple as that –we don’t sit down, and we have a very quick meeting. Unpretentious and uncomplicated as it is, I believe it is a useful and positive morale-boost for everyone, as it helps them to keep abreast of everything. It is especially beneficial for the younger members of the company to have their brief say which I’m sure enables them to become more confident when speaking in front of their peers and superiors. I hope so anyway. While some light humour is permissible a strict rule of the meeting is never to humiliate, reprimand or embarrass any individual for something they say. The aim is to encourage any new thoughts or ideas and discourage any negativity or bullying. As a leader, I believe it is essential to show respect to your colleagues, whether they are higher or lower in seniority. Every member of our team is valued, and their contribution to the daily meeting is always welcomed and appreciated. One thing I would heartily recommend to any CEO is to play golf as often as possible!